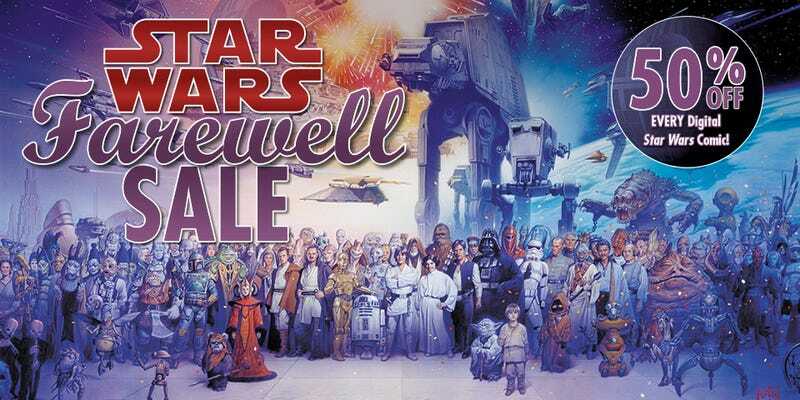 Dark Horse Comics, publisher of Star Wars comics since the early 1990s, won't be allowed to sell any more after New Year's Eve when Marvel takes over the franchise. So they're putting all of them on sale. That's half-price per issue or, if you prefer, $300 for the full 28,353 pages' worth. Our friends at ion have posted a list of some of their favorite Star Wars comics, which should help you get started. I haven't read them yet, but I'm very curious about The Star Wars, a mini-series based on George Lucas' original concepts for the movies as well as Rebel Heist, a well-reviewed caper set around the time of Episode IV. Browse through Dark Horse's online listing of Star Wars comics and see what strikes your fancy. You can buy and download the comics to a phone or tablet. Marvel is launching a trio of Star Wars comics early next year, headlined by a comic simply called Star Wars that takes place after Episode IV and is written by one of the industry's top writers, Jason Aaron. A Kieron Gillen-written Darth Vader comic and a Mark Waid-written Princess Leia comic will follow.